Heavy Duty Front Suspension Kit ( 2 shocks ) for an HPX & XUV Gator Utility Vehicle. The heavy-duty front strut kit provides improved ride and handling for Gator HPX Utility Vehicles when equipped with a deluxe canopy with the hard door kit or with a front blade. Heavy-duty front struts with higher-strength springs replace the standard components. Strongly recommended when a Gator HPX is equipped with a 72-in. Front Blade or 72-in. V-Blade; will help maintain the lift height of the blade as well as improve ride and handling. 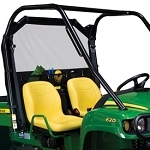 Recommended when a Gator HPX is equipped with a deluxe canopy and the hard door kit. For any vehicle configuration in which the operator experiences frequent strikethrough or bottoming-out of the front struts, the heavy-duty front strut kit will help reduce or eliminate the occurrence. The item was just what I WAS looking for. No problems with ordering, shipping, or delivery. Totally satisfied. Will continue to look for items with Green Dealer when needed. The heavy duty struts are awesome. These raised the front height about 3 inches from stock and now the gator sits level. They also eliminated the bottoming out issue. I recommend these highly. The green dealer also shipped me some hardware that was lost in shipping with no problems.